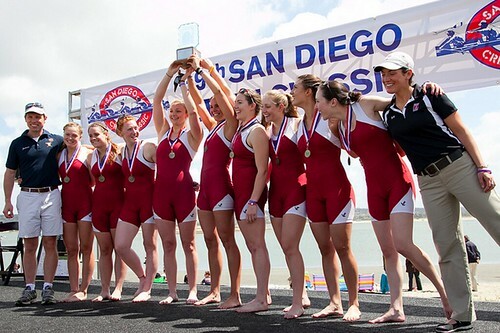 Courtesy Ellie Oken The women’s varsity eight hoists the first place trophy after winning its final heat in San Diego. The Owls hope to build on a San Diego Crew Classic victory. Women’s rowing is setting new standards for its program this season. Coming off its first-ever victory at the San Diego Crew Classic on Sunday, April 1, the varsity eight is committed to improve and help the team have a chance to claim its first Atlantic Ten Conference title at the league championships on May 5. First-year coach Jason Read called the regatta the “spring Super Bowl of rowing” as it featured nationally ranked rowing teams. The varsity eight team won its race in open water and defeated No. 8 University of California, Berkeley for the first time in program history by 4.06 seconds in the Open Women’s event, while also finishing ahead of respectable teams from the University of British Columbia and No. 3 (t) University of California at Los Angeles. To qualify for their event’s final, the Owls’ varsity eight placed first in their trial heat on March 31, outpacing California by 3.84 seconds and finishing ahead of Union B.C., who took third. Read, who is currently training for the London Olympic trials in June, alongside assistant coach Joe Spencer, said the varsity eight pulled out the win due its execution of a “strong technical” race. The varsity eight, composed of freshman Ellie Oken, sophomores Victoria Joye and Jackie Lees and juniors Claudia Loeber, Brittany Adell, Joanna Sutor, Jeanine Lees, Paige O’Sullivan, is led by lone senior Taylor Wasserleben. The Willow Grove, Pa. native said it was the most memorable race of her career. Read said mental preparation propelled the boat to the historic victory, despite a technical malfunction with the squad’s cox box. The device used by Oken, who is the boat’s coxswain, did not work prior to the start of the race, which hindered her ability to communicate to the boat’s rowers during the race. Oken realized the cox box wasn’t working, but the team didn’t have time to replace the equipment. The teammates agreed that the boat relied on chemistry to overcome the technical issue and pull out the win in their event. The squad is looking to carry its momentum into the Knecht Cup held in Pennsauken, N.J. on April 14 to 15, which will serve as a preview for the A-10 championships. Last season the Owls finished in seventh place as a team at the A-10 championships, while the team had its best finish since 1998 at the 2010 championships when Temple tied Saint Joseph’s for third place in the field. In the previous meet, the Owls’ lightweight varsity eight captured the program’s first-ever Top 10 ranking after finishing second at the 30th Memorial Murphy Cup on March 24 in Pennsauken. The Owls’ silver medalist squad composed of freshmen Laura Turner, Gina Inverso, Kate Turner, Caroline Slusarczyk, sophomores Lauren Kidd, Kelsey Joniec and Mary Kate Louge, senior Sarah Jennings and Oken.